Who Inherits in Idaho When There's No Will? Idaho's probate laws cover the process of "intestate succession" — what happens to an estate when an Idaho resident dies without having made a last will and testament. These intestate succession laws dictate who inherits the deceased person's Idaho probate estate. They also apply when a person who owns real estate located in Idaho dies, even if he resides elsewhere. Here's how Idaho's laws for intestate succession apply to various situations. Where "descendants" are noted, these are children, grandchildren, and great-grandchildren — anyone "descending" from the decedent by birth or adoption. Descendants do not include foster children or stepchildren not legally adopted, but they do include biological children who may be born after the decedent's death. Community property is generally accepted to be anything acquired by spouses from the date of their marriage through the date of death, regardless of which spouse may hold the title. Separate property is anything the decedent owned prior to the marriage or that he received by way of gift or inheritance made solely to him during the marriage. "Per stirpes" means that in the event the decedent's child is deceased, his share of the inheritance passes to his own children to be shared equally among them. 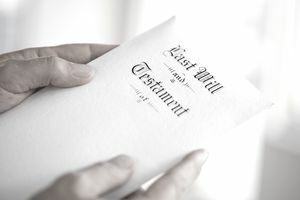 The decedent is survived by a spouse and descendants: The surviving spouse will inherit all the deceased person's share of community property and one-half of the deceased person's separate property. Descendants will inherit the remaining one-half of the deceased person's separate property per stirpes. The decedent is survived by a spouse but no descendants or parent(s): The surviving spouse inherits the deceased spouse's entire probate estate. The decedent is survived by a spouse and parent(s) but no descendants: The surviving spouse inherits all the deceased person's community property and one-half of the deceased person's separate property. His parent or parents inherit the remaining one-half of his separate property. The decedent is survived by descendants but no spouse: The deceased person's descendants inherit the entire probate estate per stirpes. The decedent is survived by his parent(s) but no spouse or descendants: His parents inherit his entire estate. The decedent's estate will pass to his grandparents, siblings, nieces, nephews then cousins if he is not survived by a spouse, his parents or any descendants. In the unlikely event that none of these people are living, his entire estate will escheat or go to the state of Idaho. What Will You Inherit From an Idaho Intestate Estate? Even if you're entitled to an intestate share of your relative's estate, you won't inherit if his entire estate is made up of non-probate property, or assets that pass directly to a named beneficiary by operation of law, such as life insurance proceeds, and therefore do not require probate. You won't inherit if your relative owed debts at the time of his death that exceeds the value of his probate property. All debts and taxes must be paid first before inheritances are distributed. Relatives receive shares only of what is left over. When this happens, the estate is said to be "insolvent." Consult with an Idaho probate attorney if you are unsure of your legal rights as an intestate heir. Who Inherits in Arizona When There's No Will?